"Appeal For Courage" Surpasses "Appeal for Redress"
Despite the fact that the mainstream media, including CNN, CBS, and NBC, has actively supported the “Appeal for Redress” group who are appealing to Congress to withdrawal from Iraq, a new group Appeal for Courage has passed the antiwar group in signatures in 1/6th the time with a fraction of the same exposure! Do calls for retreat back home harm the troops here in Iraq? Of course they do. The enemy, particularly Al-Qaeda in Iraq (AQI), see these calls as proof their strategy is working and increase their attacks. Iraqis who would otherwise help us hear these calls and choose to stay in the background, fearing that they will be targets if we withdraw prematurely. And yes, we believe it affects our morale. The perception of a lack of support for our mission by members of our own government has created a sense of frustration for many soldiers. 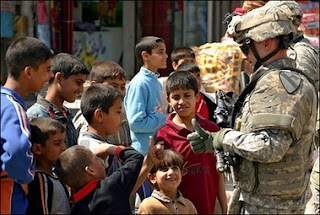 AppealForCourage.org is a means for those soldiers to send a message to Congress that they want to stay in Iraq until the mission is complete. With no formal advertising it has already garnered over 1,500 signatures [over 1730 today!] in less than a month, over half from troops who have served in theater. These currently serving military members want victory in Iraq and are respectfully asking Congress to halt calls for retreat that hurt their mission and increase the risk they face. This large response in such a short time indicates that opponents of the war do not represent the majority of the military actually fighting it. Opponents of the war are being intellectually dishonest because they say they want to withdraw our troops but refuse to acknowledge the consequences. It is widely acknowledged that a premature withdrawal will mean an Iraq returned to dictatorial rule-after much more horrific violence than what we’ve seen- as a puppet state of either Al-Qaeda or Shiite extremists. Extremists will have access to wealth and a stable base to expand their power. It is highly naïve to assume they wouldn’t use this power to attack the democracies which threaten their way of life, particularly America. No one is pro-war, but we should be pro-victory. There is a difference between ending the war now by abandoning our Iraqi allies, suffering a humiliating defeat that will encourage future attacks on the American people we’ve sworn to protect, and ending it gradually with a stable democracy capable of defending itself. What will victory be like? Iraq will not be a serene la-la land with children skipping down the street. It may be just as violent as today, though that’s unlikely. Victory is when the fight is led by the Iraqi military and police, not by the Coalition. Once the Iraqis are able to do the job we are currently doing, we can leave with honor, knowing we’ve helped bring freedom not just to one country, but an entire region. We don’t all have the “big-picture” of what victory will be like, but we see the progress all around us. We hear that we’re losing the war, or the somewhat bizarre claims we’ve already lost it, and we look around us and say “What are you talking about?” We’re working to build up the Iraqi army, convincing opposition tribes to join us, building up the Iraqi police, clearing caches. Creating a professional army and a police force takes time, but the Iraqis continue to make steady progress. They have created the foundation of manpower and are now developing logistics and learning command and control. It seems like claims we’ve already lost get more frantically insistent the more progress we make. To say we are losing and should leave is as wrong as saying we’ve finished our mission and should leave. The service members who have signed AppealForCourage.org are saying we want victory in Iraq. Yes, there is violence happening every day, and there will be many bad days ahead, but we will win this, given time. We will win because we have a plan for victory, and the enemy does not, short of hoping that we leave. We are saying we would rather go home later with victory than today in defeat. We are saying we want the war to be run by the military commanders on the ground. Finally, we are respectfully asking Congress to support our mission. If you want to hear more from the Appeal for Redress guys, their leader is now callng for active resistance of government! In related news… The New York Post discusses why the surge is working in Iraq.